Seattle Initiative 122 fails to deliver on its noble promise to make elections more honest and instead would use tax dollars to set up an ineffective and convoluted system to fund campaigns. BACKERS say Seattle’s Initiative 122 would make city elections more honest and decrease the influence of “big money” in politics. That sounds appealing, but the proposal is a grab-bag of varying rules that tax citizens to pay for city campaigns and could potentially benefit well-organized special-interest groups. The initiative would impose a property tax to fund a public-financing system for Seattle City Council and mayoral races. The goal is to spread out campaign funding beyond the usual deep-pocketed individuals, companies or organizations that influence elected leaders. The initiative would give registered voters vouchers to donate to political campaigns, while also limiting how much candidates, who opt in to public financing, can spend on campaigns. • The proposal counts on people not participating. Seattle’s 410,000-plus registered voters would receive four vouchers worth $25 each to give to candidates of their choice. That means an estimated 1.64 million vouchers worth $41 million would be issued. But the property tax would raise only $6 million to fund the primary and general races in a given election year. Administrative costs are projected to eat up a sizable $600,000 of that, leaving only $5.4 million for the campaigns. Only about 216,000, or 13 percent, of the vouchers could be redeemed before the money runs out. While the initiative suggests all voters should have a chance to contribute to campaigns — using taxpayer dollars — it assumes only a small percentage of voters would actually bother to do so, even when the money doesn’t come out of their own pockets. More money, more apathy. • The vouchers give well-organized candidates, especially incumbents, an advantage. Some members of activist organizations are giddy at the prospect of swooping up as many vouchers as early as possible. The vouchers would be mailed in January, well before the August primary and November general election. Filing week isn’t until late May, meaning a candidate who decides to take on an incumbent would be starting behind since voters might already have awarded their vouchers. • The initiative calls for yet another property-tax levy that would cost about $8 per year for a home valued at $400,000. Proponents say that is a nominal amount compared with the costs of other levies. That’s true, but every new tax adds up. Is it worth it considering that the program assumes less than 13 percent of voters would participate? 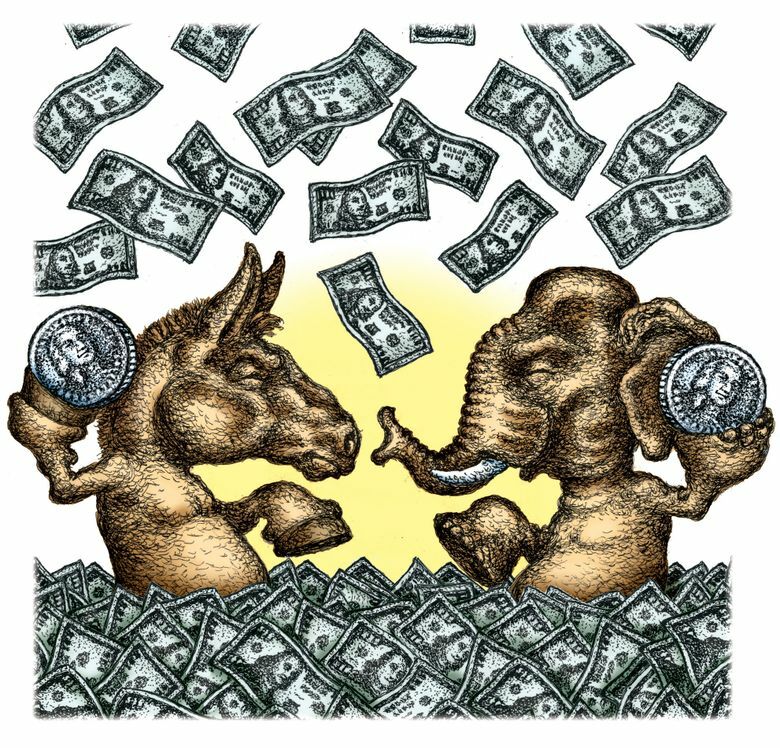 • Limiting campaign spending is doubtful. Since the program is voluntary, candidates who chose to participate must agree to a spending cap, while those who don’t can raise as much as they want. But that rule can be bent. For instance, Candidate A raises cash through the vouchers and Candidate B raises private money. If Candidate B’s funds surpass Candidate A’s, then the cap is lifted and Candidate A not only can redeem vouchers up to the limit, but can also go out and raise unlimited private money. Some provisions in the proposal are worth considering as separate policies. Among them are banning political contributions from contractors that do more than $250,000 worth of business with the city or from groups that spend more than $5,000 per year lobbying the city. Also, there seems to be a bigger play here. The I-122 campaign itself has raised more than $500,000, mostly from a few deep-pocketed, out-of-state donors who want to use Seattle as a testing ground for campaign-finance-reform ideas. Trying to make campaigns more transparent and less reliant on big donors is a noble endeavor, but that was a motivation behind the city’s 2014 switch to district elections, which are in their first election cycle now. Seattle’s own homegrown experiment should be allowed to unfold without this complication. I-122 backers don’t make a persuasive case that it would achieve their stated goals. Rather it would instead slap Seattle with a convoluted system that is unnecessarily tedious for both candidates and voters to navigate.